I'm participating on an ASP project which goal is using web 2.0 for e-learning services. Practical PHP Testing Patterns: Parameterized Test explains how to use @dataProvider to avoid duplicating the code for some tests. 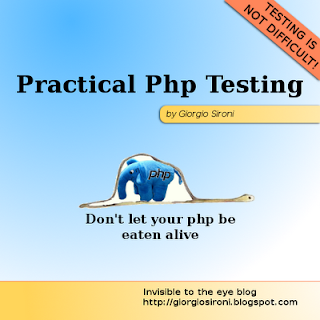 Practical PHP Testing Patterns: Testcase Class Per Class is the simplest structure for organizing test cases. We'll get more complex next week. WebSockets in 5 minutes is a panoramic on the functionalities and current support of WebSocket, and which alternatives we have available.